The Octagon is perhaps the most distinctive building on the Amherst campus. With its unique shape and recently repainted bright yellow exterior, it draws many a stare as it sits at the main entrance to campus on the hill overlooking town. The Octagon is the fifth-oldest surviving College building, and was built in 1848, designed by Henry A. Sykes of Amherst (King, 310). 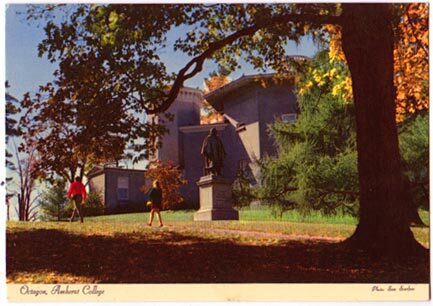 It began as a home for the Astronomy and Geology Departments, and home to the College's collections. 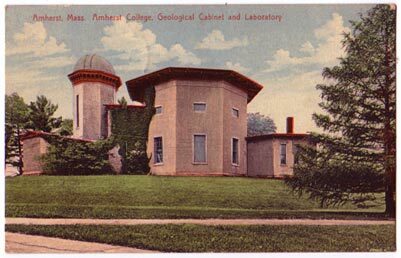 (Webster) allowed the Geology department to move out, and until the construction of the Arms Music Building gave the Music Department a new home. It is now home to a number of lecture and meeting rooms.